Since 2002, I have have researching and writing about the radiant light bodies or ‘power garments of the gods’. There is a perennial belief that when we left our heavenly home, we left our garment up there — our robe of light — and we want to return to it, to be able to wear it again. Our light body garment is now being kept for us in reserve up there, and one of the great tragedies of blowing it in this life is that you won’t be able to go back and wear it. As awakened wanderers, we, yearn to go home to our garment and to feel its ethereal touch on our soul. There is a wonderful message in the Gnostic texts (especially the Hymn of the Pearl) which has a lot to say about the heavenly garment. It says that when you left the world above, and you passed from one state of initiation, frequency or dimension to another, you changed garments. Leaving behind your brilliant, radiant, luminous enlightenment suit you took on a slowed-down, dense, material fractal image of yourself. Each time we cross between dimensions we augment the garment or alter it – adding (or sometimes subtracting) something along the way. 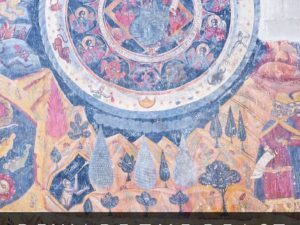 As I discuss in my forthcoming book, “Ascension to the Celestial City,” the Essenes were foremost among they who believed that in order to enter the celestial realms one is required to become like the angels who dress lightly in a white robe of glory. Attaining this robe of light required a transformation or perfection of our being from earthly flesh to celestial flesh of which the Essenes claimed to be experts. 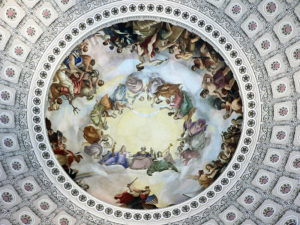 In Revelation (22:14), John espouses Essene belief when he says, “Blessed are those who wash their robes, so that they will have the right to the tree of life and may enter” the celestial city or the New Jerusalem. 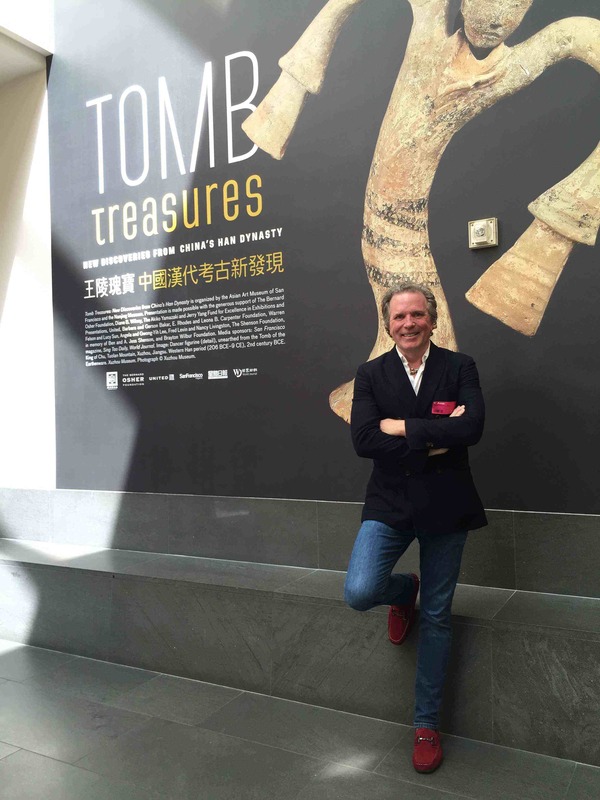 In April, 2017 I had an opportunity (thanks to a wonderful friend) to visit the Tomb Treasures exhibit at the Asian Museum in San Francisco. 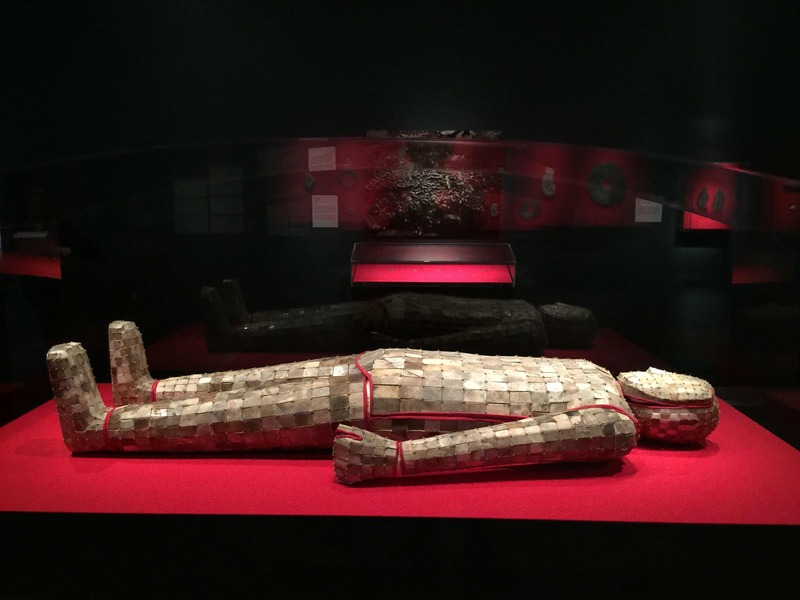 This exhibit featured the mystical jade resurrection suits or exoskeletons of ancient China’s Han dynasty, one of the most powerful civilizations of the ancient world. I have long wanted to see one of these amazing suits up close. On view for the first time in the U.S., it was a privilege to attend this exhibit and to see-feel-experience, first hand, the Han ascension technology. I felt almost home. Actually, I was on my way to give a presentation at the New Living Expo in San Mateo, located at the heart of Silicon Valley, home of the Transhumanist take-over of humanity. My presentation explored how the gods of the Valley are trying to make the human body ‘gooder’ (in Valley speak) by packing it full of technology and growing a new iskin to protect or ‘perfect’ it (just like Dr. Frankenstein perfected his creation, Adam Frankenstein). One promise of the Valley is radical life extension, with Google aiming to help us to live five hundred years or more through the magic of its nano-nutrient garment. This ‘robe of glory’ will be woven of medical nanobots that will patrol our bloodstream and release payloads of drugs to combat illness. Google’s chief technology officer, Dr. Ray Kurzweil, prophesies that by 2029 these nanobots will be 100 percent effective at fighting disease. This means the end of death, as we know it. Our souls will be able to be trapped (or interred) in their earthly shells ‘forever’. As I discussed in The Skingularity Is Near, the gods of the Valley are answering an ancient impulse to transcend the flesh and to reclaim our immortal garment of light. They just aren’t going about it the right way. The ancient Chinese knew something that Google’s big brains may wish to process. That is, our ultimate goal is not immortality. Our goal is resurrection from earthly flesh and ascension into a body of celestial flesh and eternal life without limit. 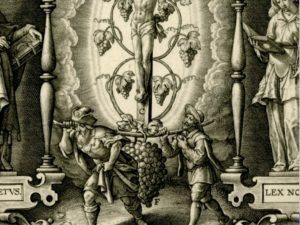 Is there really a human-made garment we can acquire that will assist in our resurrection and put us on the sacred path to ascension? Yes, there is. At least according to the ancient Chinese who made suits of jade and gold for exactly this purpose. For years, archaeologists considered these suits to be legendary. 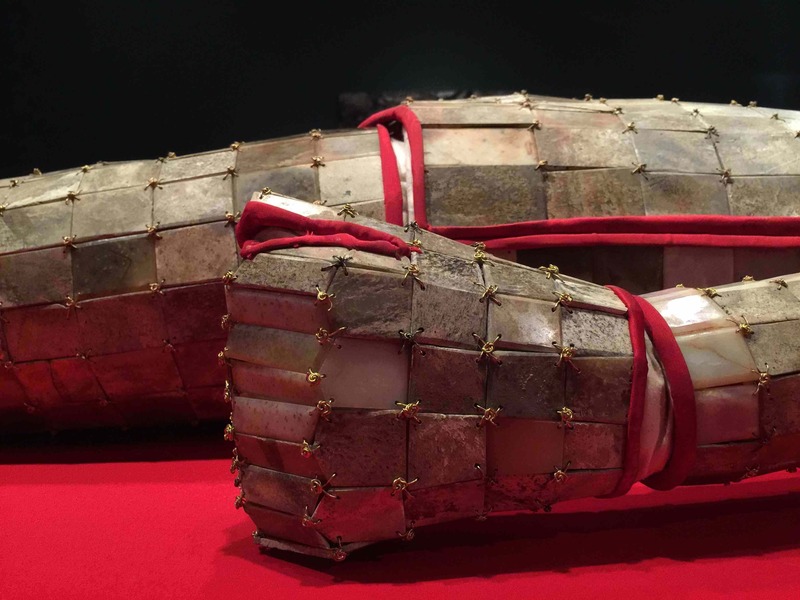 Then, in 1968, two complete jade suits were discovered in the tombs of Liu Sheng and Lady Dou Wan in Mancheng, Hebei, proving their existence. More suits were discovered in the following decades. 24 of these suits have been discovered to date. 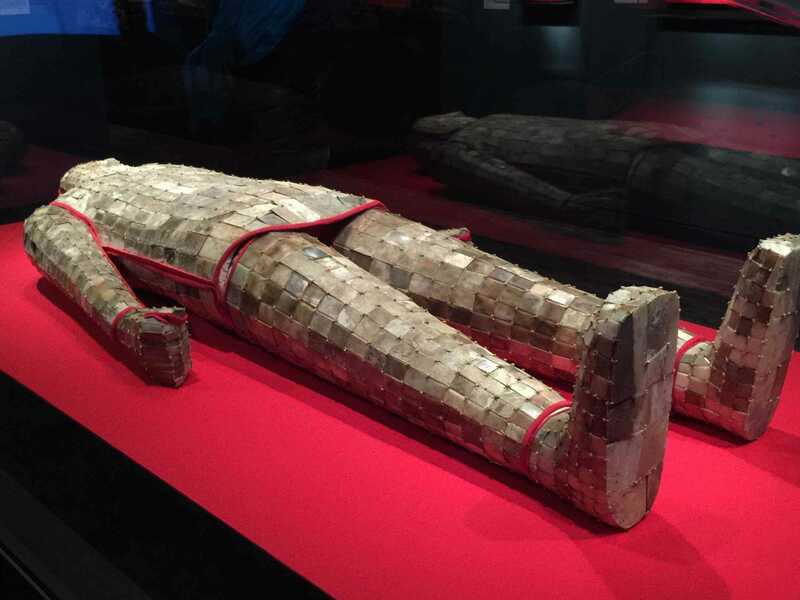 Typically, these suits or shrouds, as they are also called, consist of over one thousand pieces of jade strung together with gold wires. 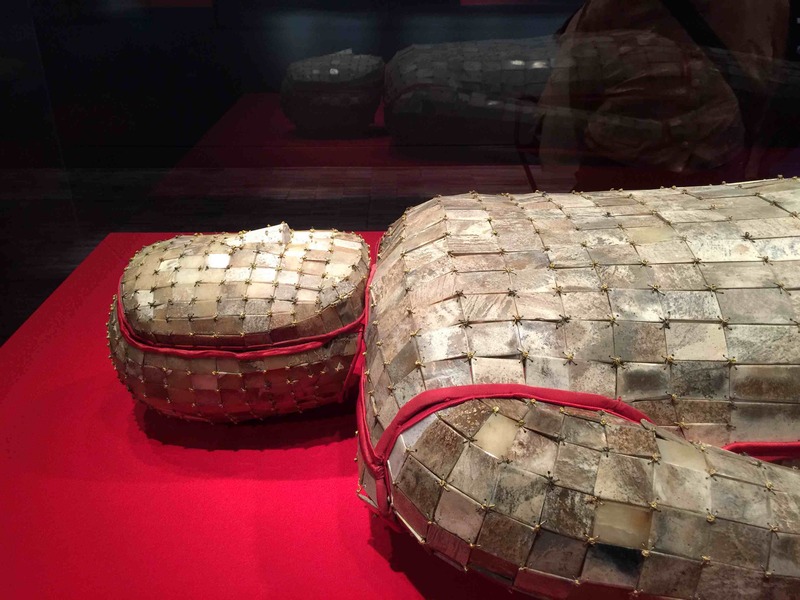 The jade suits of Liu Sheng and Dou Wan consisted of 2,498 plates of solid jade connected with two and a half pounds of gold wires. They required over ten years to make. Jade suit, Western Han period (206 BCE–9 CE), 2nd century BCE. Unearthed from Tomb 2, Dayun Mountain, Xuyi, Jiangsu. Jade and gold. The Han Dynasty was extremely powerful and ruled between 206 BC – 220 AD. It is one of the most iconic dynasties of the country and in all human history. Jade is their greatest icon. For many centuries before and after the Han, jade was considered to be of supernatural origin, and to contain the essence of life, virtue, and eternity. It was believed necessary for the rulers to use certain emblems made of it in order to communi­cate with the heavenly powers, and the pos­session of these jade objects invested the owner with rank and authority. These suits were made to protect the people from the flesh-soul. The ancient Chinese believed that every human being has two souls: a flesh-soul and a breath-soul. The ethereal breath-soul (hun) ascends after the death of the body, but the earthly flesh-soul (po) remains in the body for a year or more. 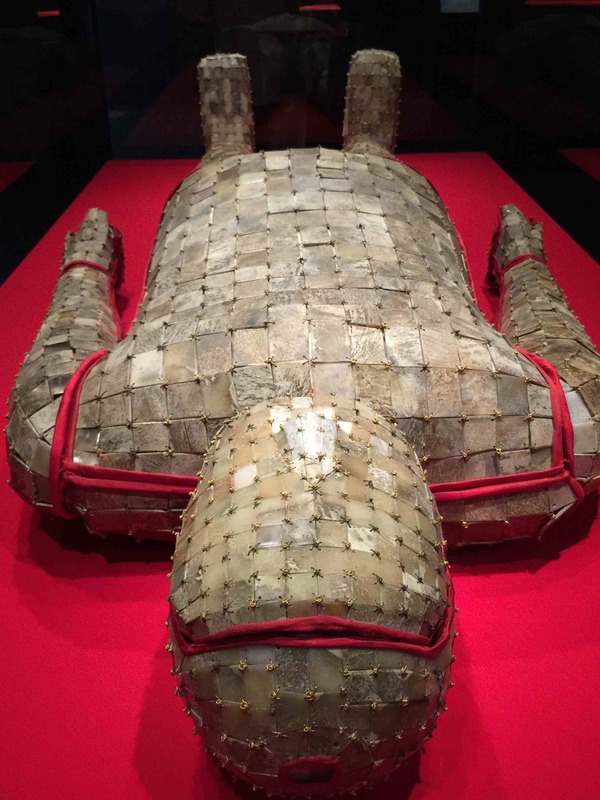 The flesh-soul was considered to be malignant, so the wealthy aristocratic Chinese were encased in jade suits to prevent it from escaping the body. All of the bodily orifices were plugged with jade to prevent escape. This would give the immortal breath-soul time to awaken and ascend from the body to begin its eternal wandering. 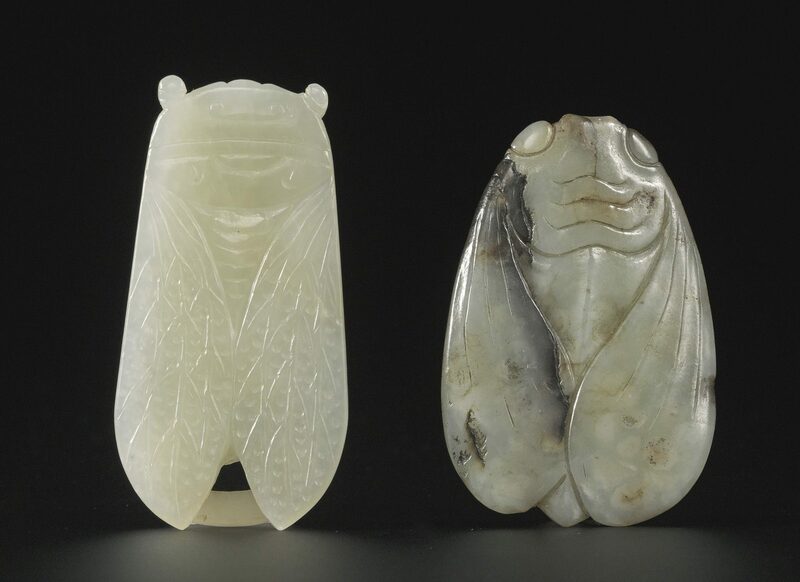 During the Han dynasty, jade cicadas were placed in the corpse’s mouth as symbols of cyclical resurrection. The life cycle of the cicada made it a potent symbol to ancient Chinese metaphysicians. They observed how it spent most of its life underground, and then at a critical moment, it digs a tunnel through the earth, up to the surface. When it reaches the surface, it sheds its old body and transforms itself. Coffin, Western Han period (206 BC–9 CE), 2nd century BC. unearthed from the Tomb of the King of Chu, Shizi Mountain, Xuzhou, Jiangsu. Jade, wood, and lacquer. The ancient Chinese buried their aristocrats deep in the earth, in coffins, and then provided them with an exoskeleton, similar to that of the cicada. This suit repelled evil influences and allowed the soul to ascend. And then, at a crucial moment, they could leave the tomb and shed the exoskeleton provided for them and transform themselves into an immortal. Jade was believed to have preservative and protective qualities that would prevent the deterioration of soft tissues and keep away bad spirits. Yet beneath the stone suits there were only crumbled skeletons. Nevertheless, since jade is porous, it’s possible that DNA from the royal couple might be embedded in the stones over 2,000 years after their deaths, giving them a form of immortality. Emperor Wen of Wei in 223 A.D. apparently ordered the practice of jade suits to be stopped because they attracted tomb looters who would burn the suits to harvest the gold thread. The ancient Chinese called jade Yu, meaning “precious stone”. The Chinese character for jade is a picture of a king holding a precious jewel. It was held in higher esteem than gold or jewels. They believed jade came from the holy mountains and was thought to be crystallized moonlight. It was created by the supernatural forces of heaven to guide humanity. Through this stone’s ethereal power, the ancient Chinese sought safe passage into the afterlife. 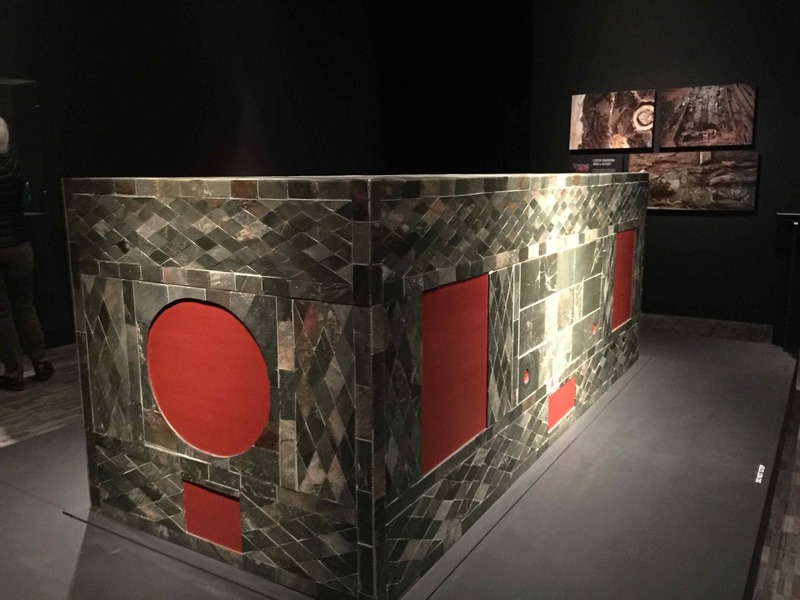 Fascinatingly…poetically… the Chinese believed jade required human handling in order to reveal its deeper beauty and to transform from its native dullness to full shining beauty. Jade is extremely hard and requires extraordinary effort and patience to transform. Hence, jade is the perfect symbol for the perfection of the eternal light body through right action. Jade’s transcendental qualities and ‘code of living’ match the later descriptions of the Holy Grail, the ‘stone from heaven’ that engenders purity, love and enlightenment. 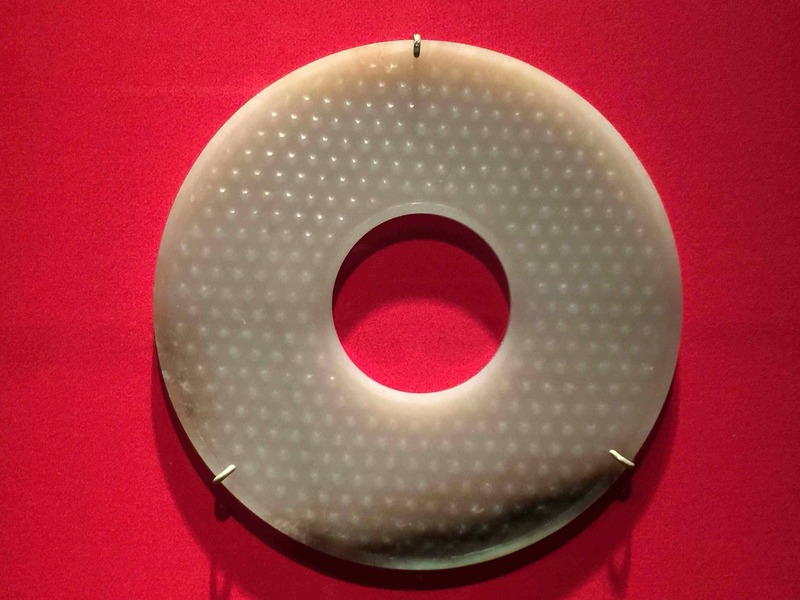 Jade Bi (pronounced ‘bee’) disks were one of the most important symbols of heavenly spiritual power in ancient China. They were often placed in tombs on the bodies of ascending aristocrats. Extremely mysterious, they were used to connect and communicate with heavenly spirits during one’s life and to help the breath-soul travel to the heavenly realms after death. These ‘stargates’ transcend time. Pendant in the shape of a dragon. To the ancient Chinese the dragon embodies heavenly power and magic. 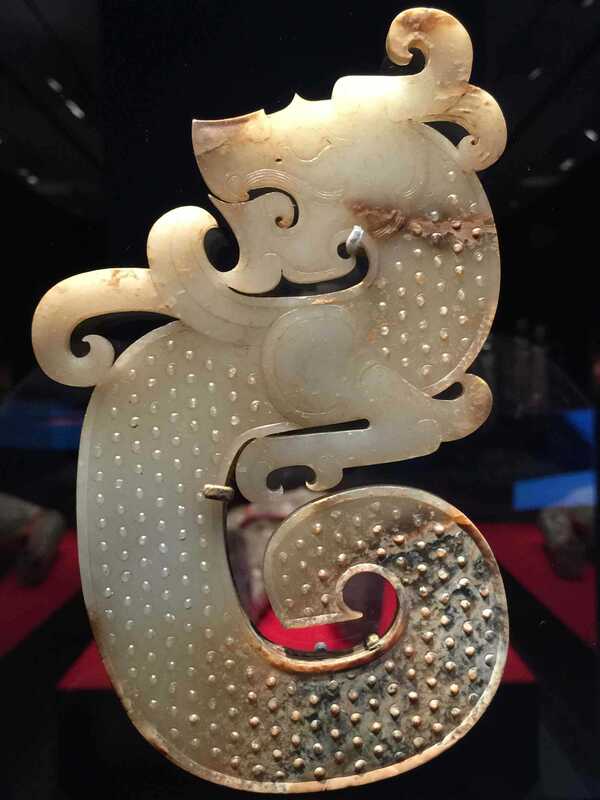 The tiny raised roundels on the dragon’s body were a common motif on ancient jade ornaments associated with the stars. Do they signify the (star) gates of the after life contained in the body of the dragon (the universe)? During the Han Dynasty, the Chinese people believed jade brought immortal life to anyone wearing the precious, ‘heavenly’ stone. This mystical stone also brought good health to the earthly body. The Chinese created a life-enhancing liquid called the “divine liquor”, which contained jade flakes or powder. These powdered flakes circulated through the body, refreshing the blood, calming the mind, enriching the spirit, soothing muscles and nourishing bones. Google envisions exactly the same thing for its nano-particles that will patrol the blood stream and eliminate unwanted intruders. They have yet to announce how their nanobots will enrich the spirit. However, following the sacred way of jade they will discover the secret for doing so. The carved lid of the tomb of K’inich Janaab Pakal I in the Temple of the Inscriptions portrays the king’s ascension to the afterlife. 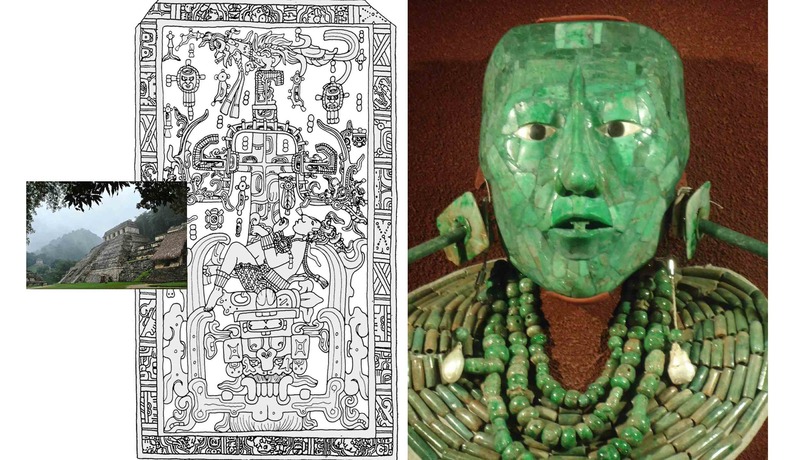 Pakal’s exquisite ascension mask was made of jade. Like the ancient Chinese, the Maya held jade to be sacred. In A.D. 100 Hsu Shen, in his dictionary, defined jade as “… the fairest of stones. It is endowed with or embodied five virtues: charity, modesty, courage, justice and wisdom.” The Chinese elite sought to have not just bones of jade, but also a heart of jade. If we aimed our civilization at attaining these virtues as a way to transform humanity, rather than transforming it via technology we will align ourselves with the free ascended realms. 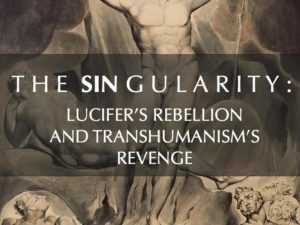 Transhumanism aligns us with the immortal and entrapped ones and slavery to machines. Confucius said that jade was a white rainbow…a thing of heaven. He taught that all men are alike; learning and practice set them apart. like heaven, its exquisiteness in earthly, like the earth, it attracts attention, like virtue, and it is esteemed by everyone and everything under the light of the sun (Zara, 26). Because of all these things, jade became a symbol of beauty and perfection, physically as well as spiritually. Confucian ethical code was constructed around the ‘virtues’ which, it said, all noble humans should live. These were chih (wisdom, integrity), i (righteousness), chung (consciousness and loyalty), shu (altruism) and the quality he upheld most of all, jen (love and human-heartedness). For the Han people, these qualities allowed for a strong hierarchy within society. The elite Han maintained the virtues of Confucius were attainable only by the aristocracy. This attitude changed around 200 B.C. when a Confucian follower, Mencius, proclaimed that all men are fundamentally good, thus removing the barrier separating the aristocracy and peasantry. We can all become ‘jade’. How? 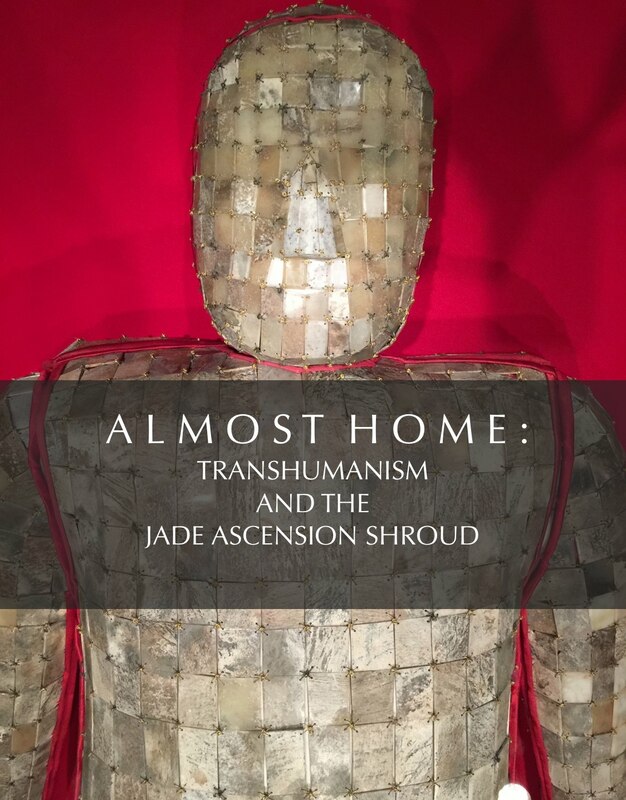 By building an exoskeleton of jade? However, anyone can do it the right and universal way. Through goodness, love, humanity…jen. With this gnosis, we are almost home. Now, where is that light body? Outstanding exhibition, only problem I see with it meaning, it was for aristocrats only the common man was forbidden. Therefore the Transhumanist was limited and not for all.